Letting go of someone you care about is never easy. Now, you’re faced with dozens of decisions you’ll need to make in a very short period of time. At Williamsburg Memorial Park, we’ve helped thousands of families get through these difficult times—and we can help you too. Our caring Family Service Counselors are available 7 days a week to help you with your immediate need and answer any questions you may have. Plus, every member of our team is professionally trained and state licensed to ensure you’re getting the best advice possible. Please take a moment to review our property and customization options, then call us during normal business hours or use our 24/7 Contact Form to setup an appointment to discuss your specific needs. 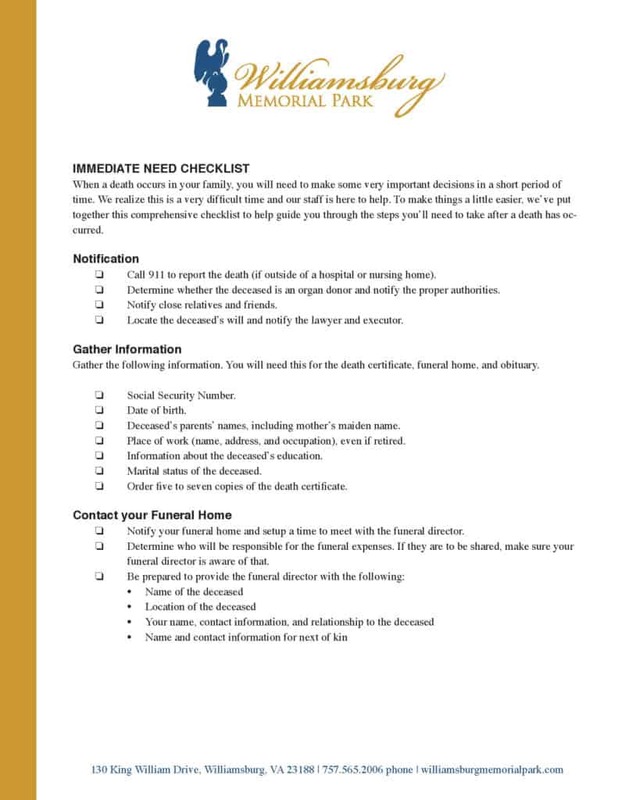 For your convenience, we’ve prepared an Immediate Need Checklist to help guide you through the decisions you’ll need to make. You can download a copy by clicking the form below.